Get your best work ready to receive the recognition you deserve! See Categories, Prepare Your Entry and Items You’ll Need below. To enter the 2018 Pinnacle Awards, the majority of the program or tools used must have been carried out between January 1, 2017, and July 31, 2018. The Las Vegas Valley Chapter uses OmniContests, a PRSA-approved vendor. Entries for 2018 are closed. The Final entry deadline is Friday, September 14. Registration is simple and allows you to save and edit your work, manage all of your entries in one account and complete one payment for entry fees. To save on entry fees, create only one account for your organization and establish your entries before the early bird deadline. 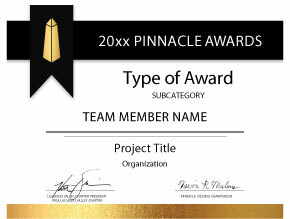 A Project Title to be displayed on all materials. Please avoid quotation marks and other punctuation. The Category and Subcategory for the project. See Categories. One or two lines of text to display on the Pinnacle obelisk. This is typically a person and an organization or two organizations. Contributors – The name and organization of up to ten people to display on certificates. The Summary and Supporting Materials as outlined in Prepare Your Entry. The summary should be two pages for Campaigns and one page for Tactics. Supporting materials such as photographs, media links, etc. should be included in the same file. PDF or MS Word format. Links to external websites or large files placed on DropBox, YouTube or similar services (optional, five URLs maximum). One image (.jpg or .png) to display during the ceremony and in the printed program. Examples include a logo, unique artwork from the entry, a screen shot of a news clip or a head shot for Individual Awards. You may order additional obelisks and certificates after the ceremony. Upload only one file that contains your summary and supporting materials. Use PDF or MS Word format. You may upload up to five files if needed – for example, a short audio or video. Large video files should be placed on YouTube or a similar service to minimize playback issues. Large files of other types should be placed in DropBox or a similar service. Provide links in your summary or separately in the online form. Keep your documentation to maximum of 15 pages, preferably less. You should be able to highlight your program in that amount of space. The judges really won’t have time to look at more than that. Uploads are limited to 50mb. Contact us if you need larger sizes. You may pay entry fees through OmniContests and the chapter PayPal account. Visa, MasterCard, Discover or American Express. Entry fees also may be paid by check or money order. © 2019 PRSA Las Vegas Valley Chapter. All Rights Reserved. Visit the Chapter Home Page at prsalasvegas.com.